According to a new market research report published by Transparency Market Research titled ‘Smart Water Meter Market (Technology: Ultrasonic Meter, Electromagnetic Meter, Mechanical Meter [Rotary Piston, Single-jet, Multi-jet, Combination, Nutating Disk, and Woltman]; Application: Residential and Commercial/Industrial; and Meter Type: One-way Meter and Two-way Meter) – Global Industry Analysis, Size, Share, Growth, Trends, and Forecast, 2018–2026,’ the global smart water meter market is expected to reach 81.52 million units, in terms of volume, by 2026. The market is projected to expand at a CAGR of 13.42% from 2018 to 2026. According to the report, the global market is expected to continue to be influenced by a range of factors in the near future, such as rising penetration of smart water meters, growing popularity of IoT networks, rising development of the smart city infrastructure, and increasing water scarcity issues across the globe. Asia Pacific is estimated to continue to lead the global market, with the market in the region expanding at a CAGR of above 15% during the forecast period. Prominent economies in Asia Pacific such as China, Japan, India, Australia, and South Korea are adopting smart water meters increasingly. Based on technology, the global smart water meter market has been divided into ultrasonic meter, electromagnetic meter, and mechanical meter. The mechanical meter segment has been sub-classified into rotary piston, single-jet, multi-jet, combination, nutating disk, and woltman. Ultrasonic meter and electromagnetic meter segments are expected to expand at CAGRs of 15.02% and 14.54%, respectively, during the forecast period. The water meter technology is changing rapidly and utility companies as well as individuals are giving preference to ultrasonic and electromagnetic smart water meters. This is because these meters do not have any moving part, which makes the device maintenance easy. Furthermore, smart water meters allow significant precision in meter reading, due to their superior mechanism. Additionally, these meters are low at production cost and they use the existing cellular networks efficiently for communication with users. In terms of meter type, the smart water meter market has been segmented into one-way meter and two-way meter. One-way smart water meters allow one-sided communication that allows the user to get the meter reading remotely with the help of drive-by and walk-by methods. One-way smart water meters are based on the AMR (automatic meter reading) system. However, AMR-system-based one-way smart water meters are older-technology products and they are rapidly getting replaced by two-way smart water meters based on the AMI (advanced metering infrastructure) system. Two-way smart water meters offer two-way communication and several other benefits over one-way smart water meters. Along with the capability of remotely collecting the meter reading, they also allow users to get notifications pertaining to the smart water meter battery as well as any kind of water meter malfunction. Moreover, users can send instructions to smart water meters. North America is expected to hold a major share of the global market for smart water meter during the forecast period. Leading share of the region is primarily attributable to strong presence of well-established players across the region, especially in the prominent economy i.e. the U.S. Moreover, the U.S. Government is investing heavily in deploying innovative smart water meters in place of older water meters across the country. North America is home to several well-established players that manufacture smart water meters, including Badger Meter, Inc., Sensus USA Inc., and Itron Inc. Furthermore, the region is witnessing high adoption of smart water meters due to continuously increasing government investments in the region. Several manufacturers in the region are focusing on enhancing the quality of their quality and developing innovative products to capture a wide customer base. For instance, in June 2018, Itron Inc. introduced an innovative product called Itron Intelis smart water meter at the AWWA Conference. Itron Intelis smart water meters offer additional water management capabilities and advanced metering infrastructure (AMI) through Gen5 networks and Itron’s interoperability. The report includes profiles of well-established players such as Kamstrup A/S, Diehl Stiftung & Co. KG, Badger Meter, Inc., Itron Inc., and Sensus USA Inc. These players are focusing on strategic partnerships. In 2017, Diehl Stiftung & Co. KG partnered with Abunayyan Holding Company, a Saudi Arabia-based provider of water-based solutions, as part of ‘Saudi Vision 2030,’ Saudi Arabia’s development program. As per this partnership, both companies would be collectively supplying more than 700,000 HYDRUS ultrasonic water meters to Saudi Arabia. The research report encompasses current market trends in the global smart water meter market. The study highlights factors that are driving and restraining the market. The report also provides opportunities for the global smart water meter market. The study provides a complete outlook for the smart water meter market, in terms of revenue generated and production volume, across multiple geographical regions: North America, Europe, Asia Pacific, Middle East & Africa, and South America. 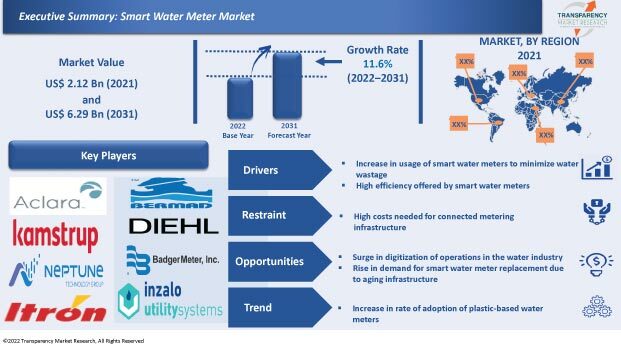 The report covers the smart water meter market in countries/sub-regions such as the U.S., Canada, Germany, France, the U.K, India, China, South Korea, Australia, Japan, GCC, South Africa, and Brazil. The report analyzes and forecasts the smart water meter market at the global and regional levels. The report consist of in-depth study of the market value chain that gives a complete overview of the global smart water meter market. Inclusion of the Porter’s five forces model helps in understanding the competition scenario of the smart water meter market. Moreover, the report also offers PESTEL analysis to help understand the macro-environmental factors affecting the market. The research study also covers market size, growth rate, and general attractiveness of the global smart water meter market. The research study on the global smart water meter market provides detailed analysis of different segments of the market including technology, application, and meter type segments. Based on technology, the market has been segmented into ultrasonic meter, electromagnetic meter, and mechanical meter. The mechanical meter segment has been sub-classified into rotary piston, single-jet, multi-jet, combination, nutating disk, and woltman. Based on application, the smart water meter market has been divided into residential and commercial/industrial. In terms of meter type, the market has been segmented into one-way meter and two-way meter. Secondary research sources that are typically referred to include, but are not limited to: company websites, annual reports, financial reports, broker reports, investor presentations, SEC filings, internal and external proprietary databases, relevant patent and regulatory databases, national government documents, statistical databases, news articles, press releases, webcasts specific to companies operating in the smart water meter market, national government documents, statistical databases, market reports, and Factiva. Primary research involved e-mail interactions, telephonic interviews, and face-to-face interviews conducted for each segment and sub-segment of the smart water meter market across geographies. TMR conducts primary interviews on an ongoing basis with market participants and commentators in order to validate the data and analysis. Primary interviews provide firsthand information on market size, market trends, growth trends, competition landscape, and market outlook. These help in validation and strengthening of secondary research findings. They also help develop market expertise and understanding of the team of analysts. The report includes well-established players such as Kamstrup A/S, Diehl Stiftung & Co. KG, Badger Meter, Inc., Itron Inc., and Sensus USA Inc. These players are focusing on enhancing their distributer network so as to enhance product reachability. For instance, in April 2018, Badger Meter, Inc. signed an agreement for acquisition of a distributor called Innovative Metering Solutions. The acquisition would help Badger Meter, Inc. in improving the utility customer satisfaction in the Southeastern U.S., as it helps in offering prompt technical as well as sales support whenever required.